While he travelled from place to place, he employed himself in collecting fossils; and we are told, that the | large and noble collection, which Woodward bequeathed to the university of Cambridge, was actually formed by him. 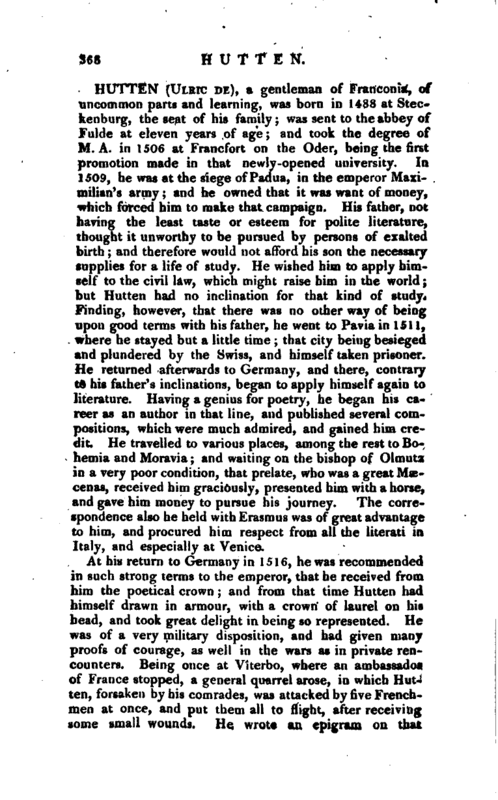 Whether Woodward had no notion of Hntchinson’s abilities in any other way than that of steward and minera­)ogist, or whether he did not suspect him at that time as likely to commence author, is not certain: Hutchinson, however, complains in one of his books, that “he was bereft, in a manner not to be mentioned, of those observations and those collections; nay, even of the credit of being the collector.” He is said to have put his collections into Woodward’s hands, with observations on them, which Woodward was to digest and publish, with further observations of his own: but his putting him off with excuses^ when from time to time he solicited him about this work, first suggested to Hutchinson unfavourable notion* of his intention. On this Hutehinson resolved to wait no longer, but to trust to his own pen; and that be might be more at leisure to prosecme his studies, he begged leave of the duke of Somerset to quit his service. The request at first piqued ‘the pride of that nobleman; but when he was made to understand by Hutchinson, that he did not intend to serve any other master, and was told what were the real motives of his request, the duke not only granted" his suit, but made him his riding purveyor, being at that time master of the horse to George I. As there is a good house in the Mews belonging to the office of purveyor, a fixed salary of 200l. per ann. and the phice a kind of sinecure,. Hutchinson’s situation and circumstances were quite agreeable to his mind; and he gave himself up to a studious and sedentary life. The duke also gave him the next presentation of the living of Sutton in Sussex, which Hutchinson bestowed on the rev. Julius Bate, a great favourite with htm, and a zealous promoter of his doctrines. In 1724 he published the first part of his “Moses’s Principia;” in which he ridiculed Woodward’s “Natural History of the Earth,” and his account of the settlement of the several strata, shells, and noduies, by the laws of gravity; which, he tells him, every dirty impertinent collier could contradict and disprove by ocular demonstration. This work, in which gravitation is exploded, is evidently opposed to Newton’s“Principia,” where that doctrine is established. H utchinson also threw out some hints concerning what had passed between Woodward and himself, and the doctor’s design of robbing him of his collection of | fossils. From this time to his death, he continued to publish a volume every year, or every other year; which, with the Mss. he left behind him, were collected in 1743, amounting to 12 vols. 8vo. An abstract of them was also published in 1723, in 12mo. 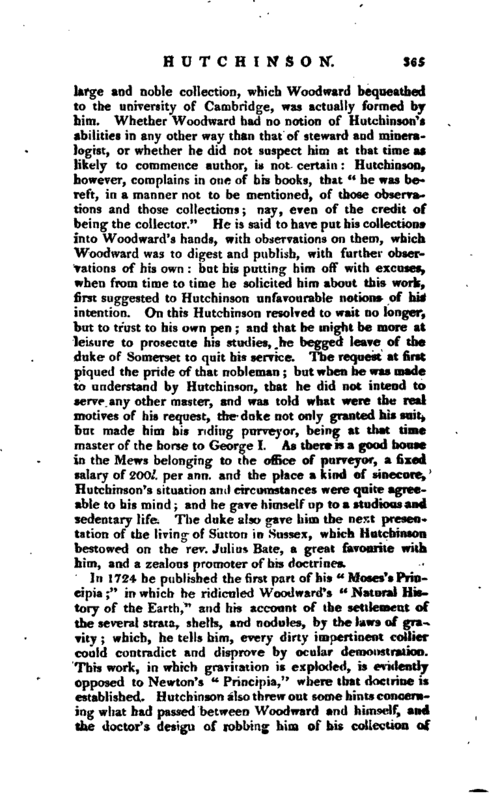 Hutchinson’ s followers look upon the breach between Woodward and him, as a very happy event; because, say they, had the doctor fulfilled his engagements, Hutchinson might have stopped there, and not have extended his researches so far as he has done; in which case the world would have been deprived of writings deemed by them invaluable. Others are as violent opposers and censurers of his writings and opinions; and the dispute has been carried on at various times with no small degree of warmth. In 1727, Hutchinson published the second part of “Moses’s Principia” which contains the sum and substance, or the principles of the Scripture- philosophy. As sir Isaac Newton made a vacuum and gravity the principles of his philosophy, this author on the contrary asserts, that a plenum and the air are the principles of the Scripture-philosophy. In the introduction to this second part, he hinted, that the idea of the Trinity was to be taken from the three grand agents in the system of nature, fire, light, and spirit; these three conditions of one and the same substance, namely, air, answering wonderfully in a typical or symbolical manner to the three Persons of one and the same essence. 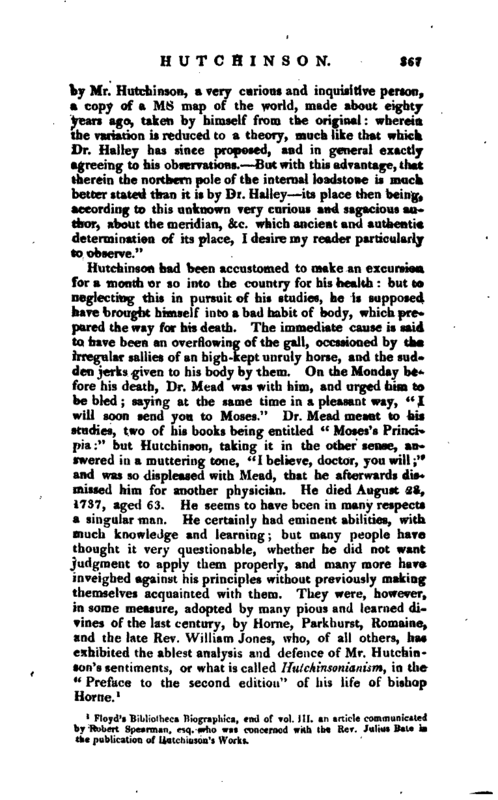 This, we are told, so forcibly struck the celebrated Dr. Samuel Clarke,- that he sent a gentleman to Mr. Hutchinson with compliments upon the performance, and desired a conference with him on that proposition in particular: which, however, it is added, after repeated solicitations, Hutchinson thought fit to refuse. 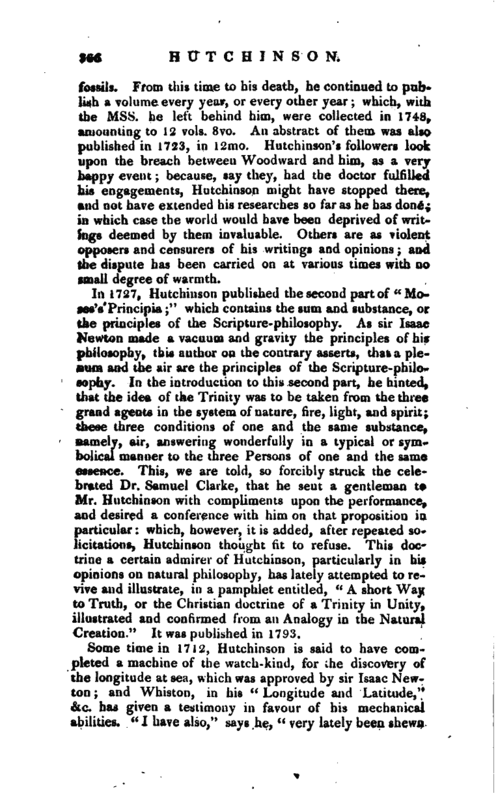 This doctrine a certain admirer of Hutchinson, particularly in his opinions on natural philosophy, has lately attempted to revive and illustrate, in a pamphlet entitled, “A short Way to Truth, or the Christian doctrine of a Trinity in Unity, illustrated and confirmed from an Analogy in the Natural Creation.” It was published in 1793. 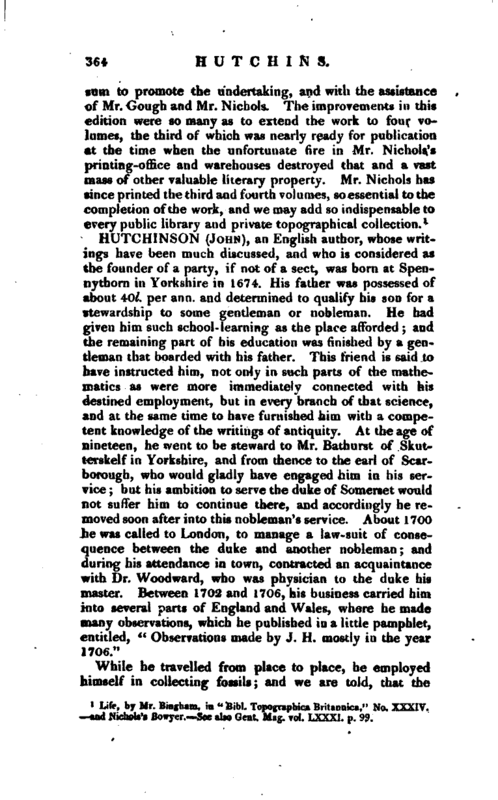 1 Floyd’s Bibliotheca Biographica, end of vol. III. an article communicated by Robert Spearman, esq. who was Concerned with the Rev. Julius Bale’s the publication of Hutchinson’s Works.